One of the most valuable and sought after works of art on the Hawaiian islands. You're not just investing in a work of art. You're curating stories. 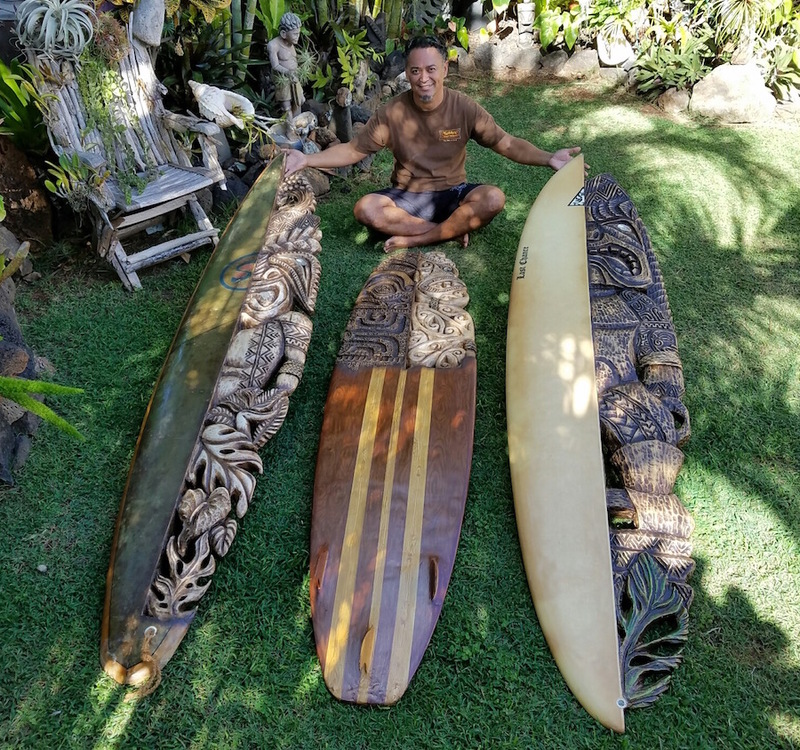 South Sea Arts only uses surfboards that have been abandoned along the fabled seven mile miracle of the North Shore Oahu, boards that have washed ashore, battered by the tumultuous pacific sea. 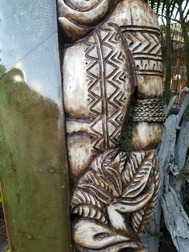 What is of no longer of use to the wave riding Hawaiians of this side of the island is reborn as treasure in our studio. The surfboard's patina, with all the hard-earned dings, dents, bumps, bruises and surf rust, is preserved and honored. 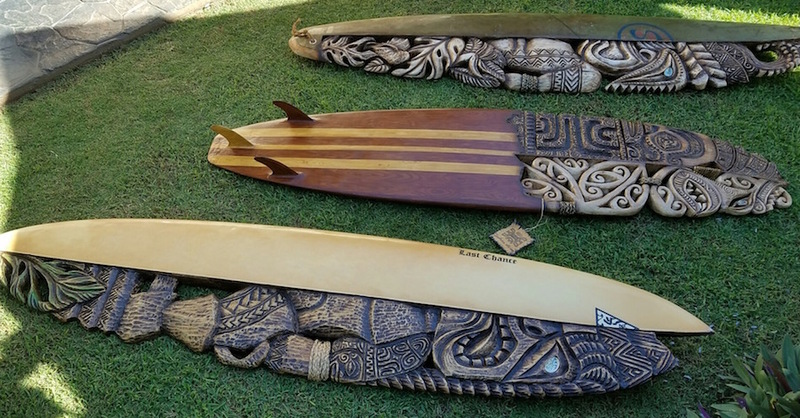 Those are the details that keep the surfboards stories alive. Gecko expertly carves into the foam revealing the rest of the story hidden in other areas. Its like a collaboration that was never anticipated with the original shaper who gave it birth. From there, the board's history and continuing life unfolds. Hundreds of hours go into each creation, with the artist working tirelessly until the board tells him when it's done. No story is ever the same. No board is ever the same. And if the board calls to you, it is meant to be in your home, and your home alone. 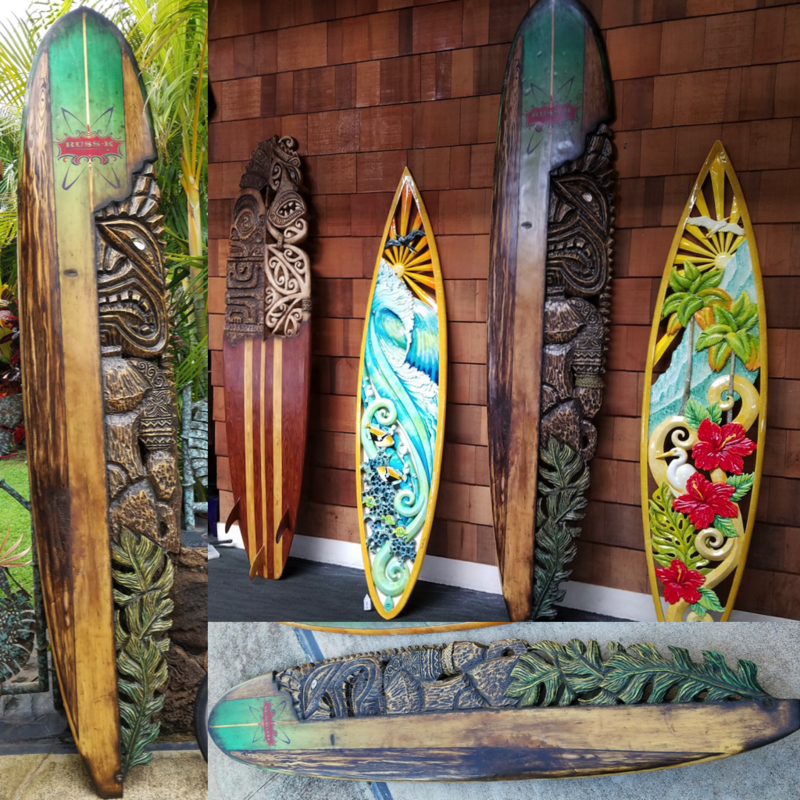 Contact Gecko to request more information on South Sea Arts recycled surfboard art and carving, or book an appointment to visit the Makakilo gallery. This exquisite board boasts meticulous engravings (see images below) which have been blended into a classic wood-striping design on the bottom half. 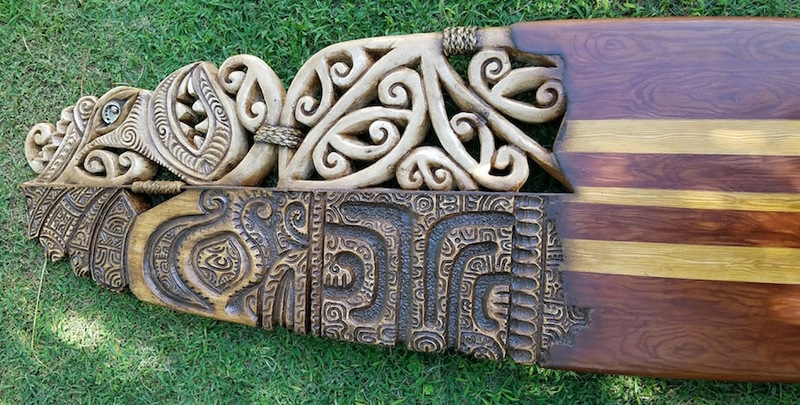 Hundreds of hours went into the creation of this work of art, and its new owner will enjoy it for many years to come. The original board has glassed-on fins and is foam-based, making it sturdy yet lightweight enough to hang on the wall of a personal gallery, hallway, or den. 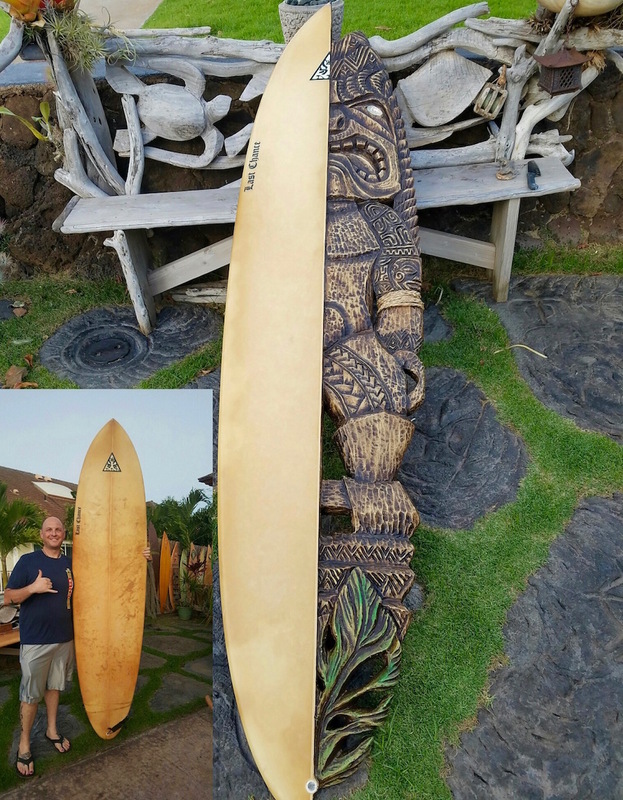 This reimagining of a vintage Russ K serves as the perfect example of how Gecko preserves the history, and mana, of a surfboard. 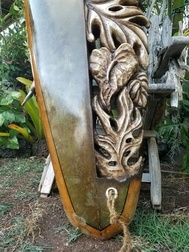 The original signature of the board's shaper (George Ku) along with the dings and subtle cracks remain, keeping the stories told by the vessel intact. 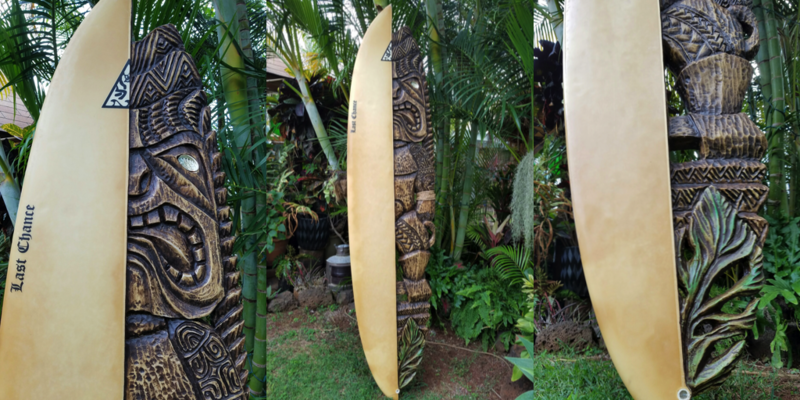 Gecko uncovers these stories as he carves, sculpts, and brings out the beauty within the fiberglass to complete the circle of life of the board. 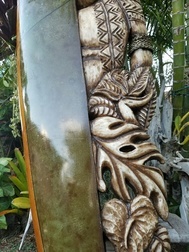 This Russ K surfboard was displayed within Haleiwa Town's Beach House restaurant on Kamehameha Highway, where it was discovered by a patron who felt an immediate connection to the work. 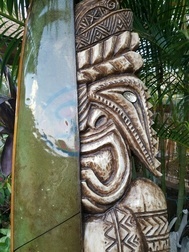 The guest made an offer on the surfboard sculpture and it now hangs within his home. Circle of life...indeed. 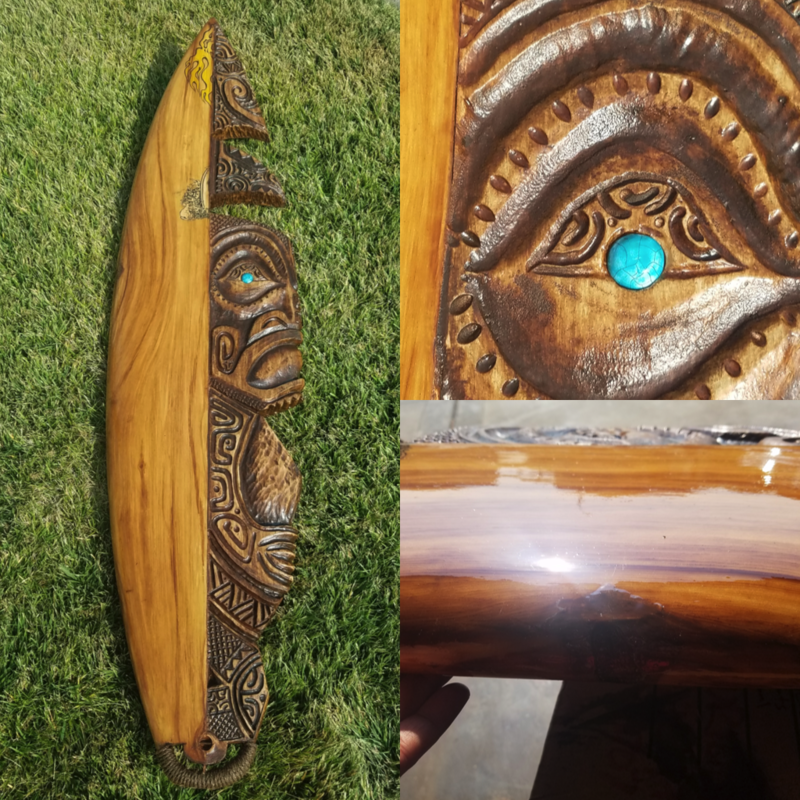 This special board was rescued, designed, carved, and finished for presentation (and sale) at Tiki Oasis 2018 (San Diego CA).